1. Nathan Bransford – Nice blog entry reference getting your book published. 2. Tami Etherton at A Cup of Tea and Sorcery – Wonderful blog post about friends, birthdays, and an adult beverage recipe. (looks yummy). 3. Ollin Morales at Courage To Create – Love the message in his post today. A must read. 4. Kim Harrison (only my fave author) – At her blog today another snippet of her writing life. Read the entry and then look around. And then go out and buy her books – you will not be disappointed by any of them. Really…you won’t..they are great. And did I mention she IS my Favorite author? Go outside today and look around, take a deep breath, then listen. You may be surprised by what you hear. In a world where everyone and anyone can publish a book they have written, is there room for more books to be published? I have seen this question, though not in the same words, on other websites, blogs, twitter, Facebook and also in magazines. It has me thinking (not questioning mind you) if I need to put my written work out there among the blizzard of books that already exist. I know that if I don’t at least try I think my family will probably lock me in a dark room until I agree to their terms. But that’s another story. Anyway back to my point about new books. There are thousands of new books each year that are printed and shipped off to various bookstores around the country and world. There are new, reprints, second editions, sequels, prequels, adapted from movies, graphic novels and a plethora of other ones freshly printed. Is this necessary? I mean are books still needed, beyond the reference and text books? Stay with me here and try not to yell too loud. And if you answered yes then, why? Why are books needed in this age of instant information gratification via the internet? And with so many books out there about the same subjects, why put out more of the same? Really there is no need to shout, I can hear some of you grumbling from way over there. For me the answer is – Yes books are necessary. Did you really think I was going to say something different? The reason is (for me) beyond the obvious of learning and entertainment. For me a book’s value is also in the emotional response that a simple collection of pages with printed words on it can evoke in my being. The way a writer pulls thoughts out of me that I didn’t realize were even hidden inside of me. Not all books have the same effect on me, some books I haven’t finished when I started them. Usually because the content wasn’t able to keep my interest, it just wasn’t for me. Not all books fit every person. And Aha! – That’s why there needs to be many, many books out there in print as well as in digital form. Books are not a ‘one size fits all’ deal. Books are also about connections. How you travel from one connection to another to arrive at a book’s destination is noteworthy. You read a book, write-up a review/ recommendation, someone reads the review then buys the book. A connection has been formed. When you can relate to an aspect of the book, whether it’s the characters, the location, or the story itself, that also creates a connection. Connections are formed every time we read the cover copy of a book. We may or may not buy it based on what the cover says, but it still forms a connection in our brains. Someone we know may like that kind of book and so you pass on the information via; the phone, twitter, Facebook, Google +, in person, etc. Today I was at Barnes and Noble, to pick up a copy of Blood Work by Kim Harrison, and my mom found a tote bag (the one in the photo). 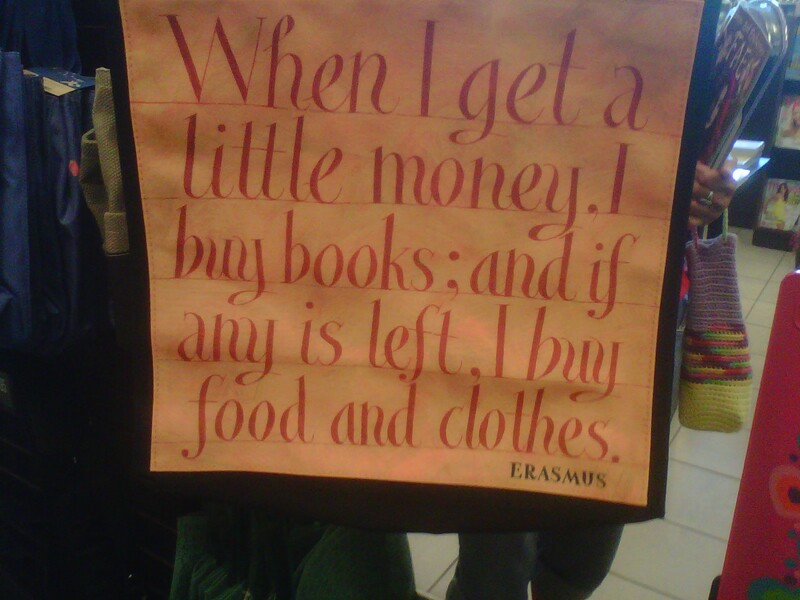 I loved the words on it – “When I get a little money, I buy books; and if any is left, I but food and clothes.” – Erasmus. After we went home I looked up the name on the internet and read a little about the person who is cited on the bag. Then I sat down and wrote this post. Connections = life. What connections are you making with books? That is what it feels like to me when I think about finishing the books and going for the whole published book thing. It’s as if I have decided to jump into the deep end of the pool (which is somewhere around 300 ft deep), in complete darkness. It’s not the fact that I don’t know a lot about the publishing world that scares, no it’s more the fact that I want to put myself out there in the world for all to see. That scares the – everything – out of me. You see for me success is actually my biggest fear. Crazy huh? But it is the truth, the whole and nothing but the unfiltered, unedited truth. Failure has always been easy, or for that matter just not doing/finishing anything at all is even easier. But now I want to do something, finish something, be someone that I admire. And the fear is creating a bit of anxiety in my soul. But this time instead of just getting stuck and staying stuck up in that there fear, I am using it to write. Using my fear energy to write with is new to me. I always thought that in order to be able to write I had to be either happy or angry, no in between gray area to work from. And granted it has worked in the past. But now as I step out of my past and look into the future I need someplace new from which to write. And fear of success is that place. I figure that as long as I have the pent up energy why not let it work for me in a positive way. That is not say that I will always write from a place of fear. Who knows next week, next month or next year I may have discovered a different place to write. For now I am using my fear instead of it using me.